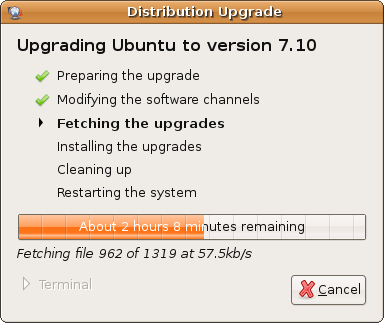 Upgraded my PC operating system to Ubuntu 7.10 (Gutsy Gibbon). The upgrade took about 6 hours because of the amount of (free) softwares installed on my computer. Compiz (read: cool desktop effects) is installed by default and it just take one-click enable it and it work well to on my 6 year old Pentium 4 1.7GHz pc. Though I think a leap to the latest AMD(or Intel Core 2 Duo) processor would be nice. All in all, I love using Ubuntu, easy software installation, no constant virus/spyware problem, low maintenance and less headache, enough said. I spent 2 hours last night configuring wireless USB driver in my Feisty Fawn box so I can surf internet in my room and update to the new Gusty Gibbon. I boot to windows, download driver and web page as reference, boot to Ubuntu,godek a little bit, boot back to windows, find more guides, godek2 again and the loop keeps going. How could you say less headache?